A race for Congress in Georgia is now linked to San Francisco. That's all because of an unordinary political advertisement. Christie Smith reports. A race for Congress in Georgia is now linked to San Francisco. That's all because of a unique political advertisement. Democrat John Ossoff and Republican Karen Handel are battling in a special election for Georgia's 6th congressional district seat in the House of Representatives. In hopes to paint Ossoff, who has admittedly received campaign donations from California, as being out of touch with Georgia voters, backers of the ad linked the Democratic challenger to liberal San Francisco stereotypes. 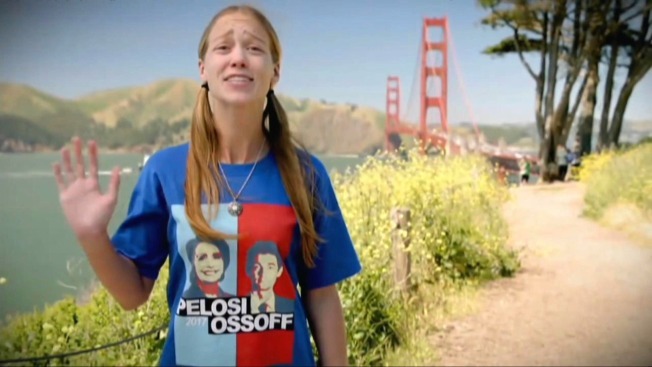 People depicted in the ad appear to represent San Francisco-based hippies or hipsters singing Ossoff's praises. One man can be heard saying Ossoff is "one of us" and another totes that "San Francisco loves them some Jon Osshof." Jason McDaniel, an associate professor of political science at San Francisco State, said the creators of the ad "want to paint their opponent as unacceptably different." "One of the purposes of the ad might be to really make people aware that you need to donate money if you care about Republicans maintaining control of Congress," he said. "They're trying to make sure that the stakes are clear." McDaniel added that the ad could be effective for Republicans because it is receiving attention. On the other hand, McDaniel said a casual voter who comes across the ad might actually vote for Ossoff because of how many times his name is mentioned. Some tourists in the city by the bay said the advertisement missed the mark. One man mentioned that the ad "didn't seem like San Francisco at all" and another said it was weird that someone from Georgia would be talking about San Francisco during their race for office. San Francisco Mayor Ed Lee told NBC Bay Area he has yet to see the ad, but he believes politicians in other parts of the country should focus on their local needs. "I'm sure if it's (Ossoff's) opponents, it will probably portray us in a negative light, but I say this, I think people of Georgia, and in particular this particular race, they need to register what their needs are," Lee said.